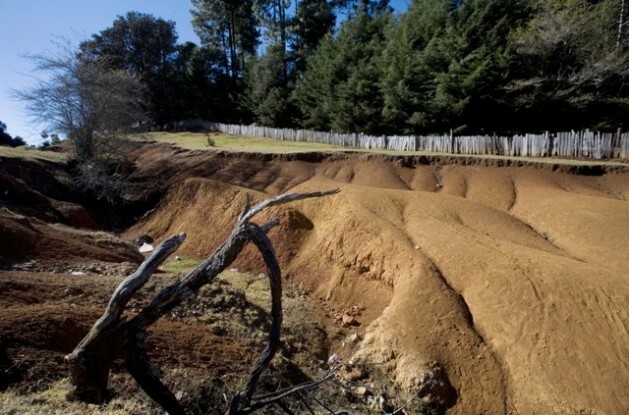 Eroded soils in the municipality of San Cristóbal de las Casas, Chiapas, Mexico. Credit: Mauricio Ramos/IPS. UXBRIDGE, May 22 2012 (IPS) - Mexico and Central America look like they are covered in dried blood on maps projecting future soil moisture conditions. The results from 19 different state-of-the-art climate models project extreme and persistent drought conditions (colored dark red-brown on the maps) for almost all of Mexico, the midwestern United States and most of Central America. If climate change pushes the global average temperature to 2.5 degrees Celsius above pre-industrial era levels, as many experts now expect, these regions will be under severe and permanent drought conditions. Future conditions are projected to be worse than Mexico’s current drought or the U.S. Dust Bowl era of the 1930s that forced hundreds of thousands of people to migrate. These are some of the conclusions of the study “Projections of Future Drought in the Continental United States and Mexico”, which was published in the December 2011 issue of the American Meteorological Society’s Journal of Hydrometeorology and has gone largely unnoticed. “Drought conditions will prevail no matter what precipitation rates are in the future,” said co-author Michael Wehner, a climate scientist at the Lawrence Berkeley National Laboratory, a U.S. government research centre in California. “Even in regions where rainfall increases, the soils will get drier. This is a very robust finding,” Wehner told Tierramérica. Without major reductions in carbon emissions from the burning of fossil fuels, global temperatures will increase to at least 2.5 degrees of warming between 2050 and 2090, depending on rates of emissions of greenhouse gases, climate sensitivity and feedbacks. The 19 models used in the study show that the increased heat will dry soils more than any additional rain can replenish soil moisture levels. Ever warmer air temperatures will cause greater evaporation, drying out soils. Climate change is also altering precipitation patterns, so that more and more precipitation occurs in winter months. And it is more likely to occur in the form of very heavy rainfalls over short periods of time, Wehner said. Once the ground is dry, the sun’s energy goes into baking the soil, leading to a further increase in air temperature, as Beverly Law, a global climate change researcher at Oregon State University, told Tierramerica at the 16th session of the Conference of the Parties to the United Nations Framework Convention on Climate Change, held in 2010 in Cancún. Large areas of the Southern hemisphere, including major portions of Australia, Africa and South America, have been drying up in the past decade, according to a study by Law and colleagues, “Climate Change: Water Cycle Dries Out”, published in the journal Nature in 2010. Another 2010 study in Nature, “Drought Under Global Warming: A Review”, examined future climate projections and also found severe drying of soils over much of the central United States, Mexico and Central America by 2060, but beginning well before then. 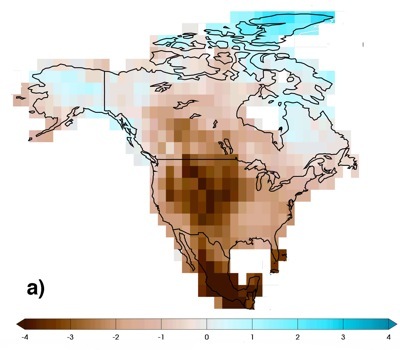 This study by Aiguo Dai, a scientist at the National Centre for Atmospheric Research (NCAR) in the U.S. state of Colorado, also projected that northeastern South America will experience similar drought conditions. “If the projections in this study come even close to being realised, the consequences for society worldwide will be enormous,” Dai said in 2010. Wehner said he was surprised the study received very little media attention, given the serious implications for the future. What this means for future generations is “a very difficult issue for me to talk about” at a personal level, Wehner admitted. At the same time, there is little research on how these much drier conditions will affect agriculture, water availability and human settlement. “I’ve been trying to work with agricultural and other experts to find out, but am having trouble getting funding,” he said. “It is hard to imagine the consequences under those future conditions,” says Lester Brown, an international agriculture expert, author and founder of the Earth Policy Institute in Washington, D.C. “We’re already on the edge,” Brown told Tierramérica. Mexico’s current drought is the worst in 70 years. Last year, the southern U.S. state of Texas suffered its worst ever drought, and this year, 56 percent of the United States was in drought conditions as of May 8, almost twice the area compared to last year at this time, according to data from the U.S. Drought Monitor. “Farmers around the world are struggling to keep up with demand for food,” stressed Brown. World grain consumption has more than doubled, as have prices. Water shortages, extreme weather and higher temperatures are all having impacts right now, he said. The situation has led to intense competition for land and water. But land grabbing is the worst kind of response to these challenges, he said. Speculators, investment banks, pension funds and state corporations have taken control of perhaps 200 million hectares of land from poor farmers in Africa, Latin America and Asia in recent years. As local people lose access to land and water, they become more desperate and it leads to violent reactions, warned Brown.